FANBOY PLANET.com . : mc-IDW-Games :. Playing the Thing in witch to catch the conscience of the King!. Yes, the news of this actually broke yesterday, but Kill Shakespeare co-creator Conor McCreery reached out to remind me that their excellent title would be driving this initiative -- and I can totally imagine having fun pitting Hamlet vs. Romeo, or Romeo vs. Juliet or... maybe I should lie down. But it's exciting! “We at Pandasaurus Games are thrilled to be working with the talented team at IDW to develop incredible games built on the amazing worlds of their comics. The wealth of creative talent that IDW has worked with is unmatched.More than that, their comic books create living breathing worlds that drip theme and beg readers to dive into headfirst. We can’t wait to help bring these worlds to life for gamers everywhere. Pandasaurus and IDW are committed to working hand in hand with world class designers and artists to build original experiences from the ground up based on the living worlds created in the pages of IDW comics,” said Pandasaurus President/Founder Nathan McNair. 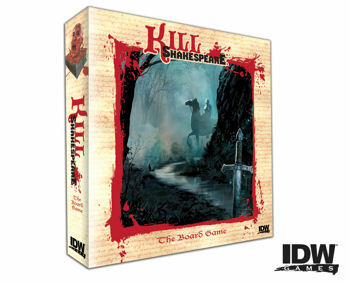 IDW Games will specialize in high-quality big-box games developed around several of IDW’s key properties, beginning in the late spring of 2014 with Kill Shakespeare and 30 Days of Night. Readers and gamers alike will now be given the chance to battle the Bard or the vampires of Barrow, Alaska in these tabletop games developed by the same game designers that brought us the critically acclaimed fan-favorite,Yedo. IDW is home to many exciting titles so look forward to the release of more details in the coming months, including new game announcements that are sure to excite both fans of IDW titles and tabletop gaming.